I'm Rob: a developer + designer turned marketing executive. I love Nathan Barry’s post on how he does email marketing. One small, but important, detail that I picked up the second time through the post is that Nathan keeps all of his subscribers in a single MailChimp list and then segments them down by signup source in order to deliver the most relevant content. This is an excellent way to structure your list. You could achieve the same result with separate lists for each signup source, but that will become unwieldy when you want to send a single campaign to multiple lists, or to your entire subscriber base. So, how do you capture signup source? It’s really easy! 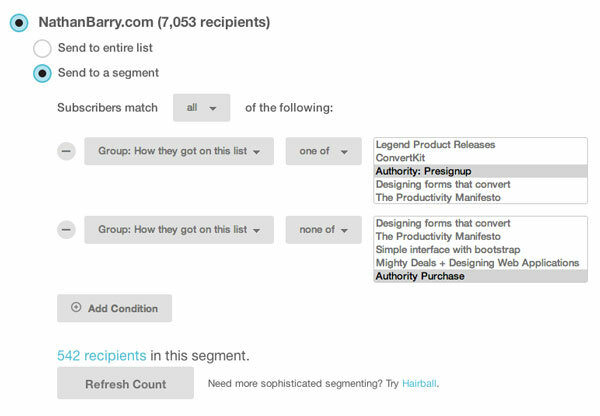 Login to MailChimp and click on Lists in the left nav and then click on your list name. Click Signup Forms and then General Forms. Add a hidden text field called SOURCE with a label “Signup Source” and a reasonable default value (in case you forget to pass one). Save your form. 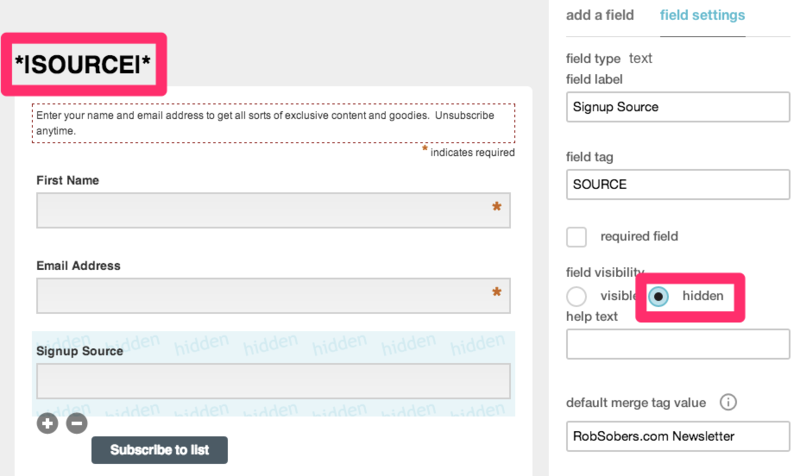 Notice how I put the merge code *|SOURCE|* in the header of the signup form as well — this essentially lets you call your list something different to people signing up for different reasons versus settling on a generic name and potentially confusing people. Obviously you should change the value parameter to whatever you want that signup source for that form to be. That’s it — now you’ll have an extra property on every subscriber record that indicates which form they came in on. If you’re capturing email addresses with multiple different incentives, this extra bit of data is vital. Update: Some people pointed out that if a visitor signs up via one signup source (e.g., “download my ebook”) and then again via another (e.g., “join my mailing list”) they’ll get an error the second time. MailChimp will tell them “Hey, you’re already on this list!” since, if you recall, there is only one list. This makes it hard to track a subscriber’s conversion history as they interact with multiple forms on your site. Most marketing automation platforms (like Drip) handle multiple conversions really well. MailChimp does not. If this is an issue for you, Paul Jarvis offers a solution in his course Chimp Essentials. Head on over and sign-up! I too have grown weary of hand-wavy business advice. Get my most poignant thoughts on marketing and tech sent to your inbox about twice per month. It’ll be…*different*.